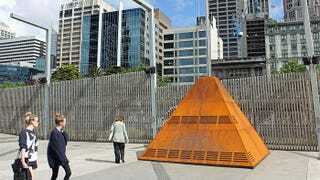 Giant theremin appears in Melbourne. Australia now 67 percent spookier. A 23-foot tall theremin has taken up residence in Melbourne, on the banks of the Yarra River. It makes the trademark disturbing woo-woo sounds you remember from 1950s science fiction movies, in response to anyone who moves or dances near it. In essence, you control it by dancing in its vicinity. Our research showed that if we were to make a seven metre tall theremin, that was pumping out that sort of elctro magnetic field, we'd probably microwave people, so that wasn't really practical.